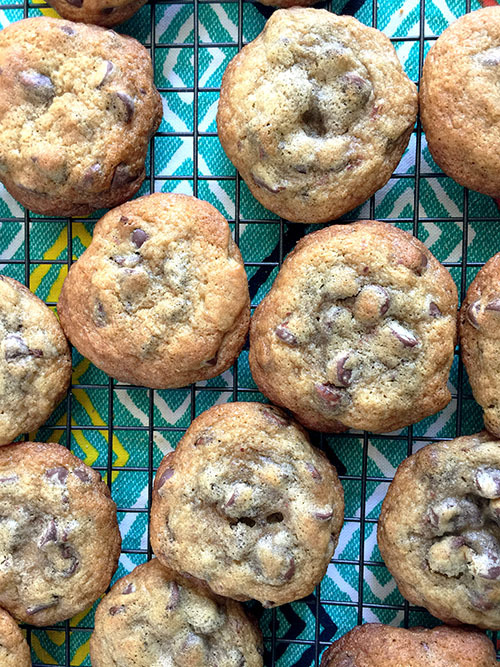 I used that recipe again and again throughout my childhood and into my teenage years, making the cookies for family and friends, and even getting roped into making quadruple batches for meetings of an organization to which my mother belonged. 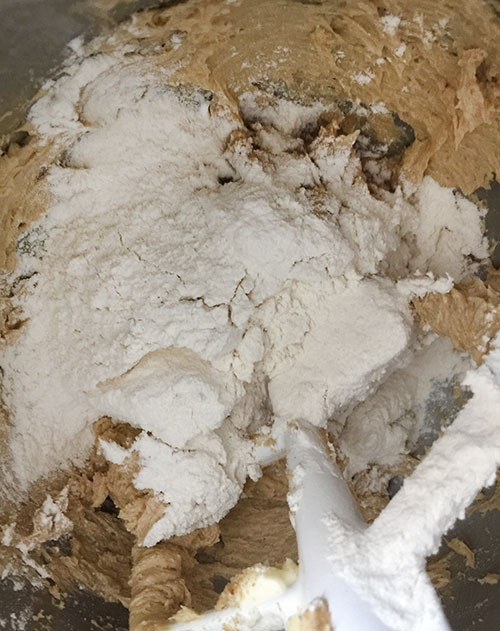 In fact, I think doubling and up to quadrupling the recipe was commonplace — my mom still believes that whatever yield a cookie recipe has should automatically be doubled. She believes in big numbers where cookies are concerned. I may have overdosed on chocolate chip cookies in my younger days. And maybe I have not made as many chocolate chips as an adult because I felt like it was a recipe I had graduated from. And I was always well-pleased with that standard recipe, so why try any others? Still, many claims of the best chocolate chip cookie recipe continue to lure me. 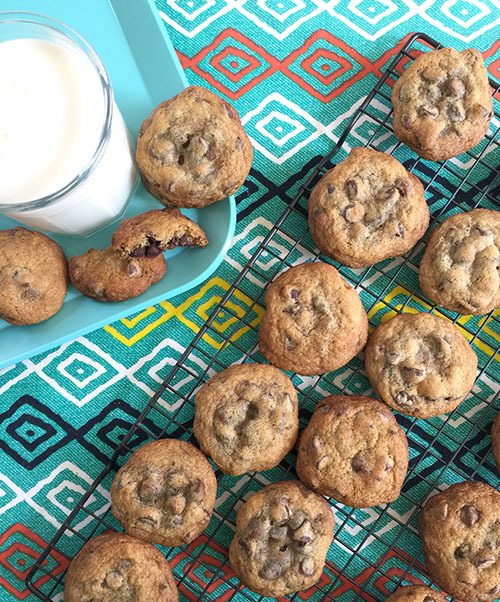 Just this past year, I made a wonderful batch of slice-and-bake chocolate chip cookies — as good as any drop recipe — for a blog post in December. 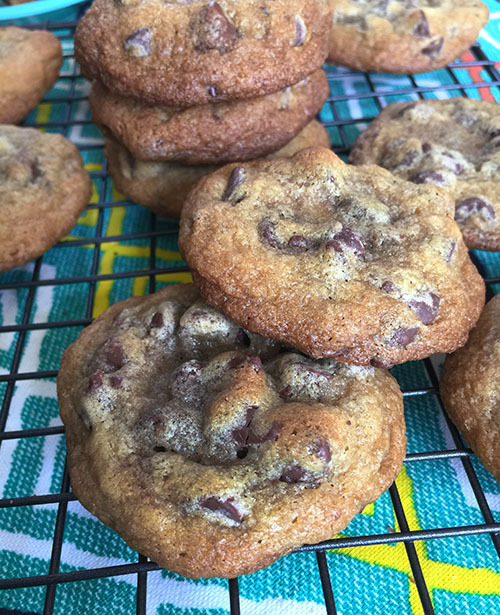 I was also happy to try the Chocolate Chip Cookies from “Baked: New Frontiers in Baking” by Matt Lewis and Renato Poliafito (2008) on the Baked Sunday Mornings Recipe roster (you’ll find the recipe here: http://bakedsundaymornings.com/2019/04/01/in-the-oven-chocolate-chip-cookies/). Scanning the recipe, it looked pretty standard, but I wanted to try it out, if for no other reason than to pay homage to what makes a good chocolate chip cookie good. There are flavors in chocolate chip cookies that are unique to them. 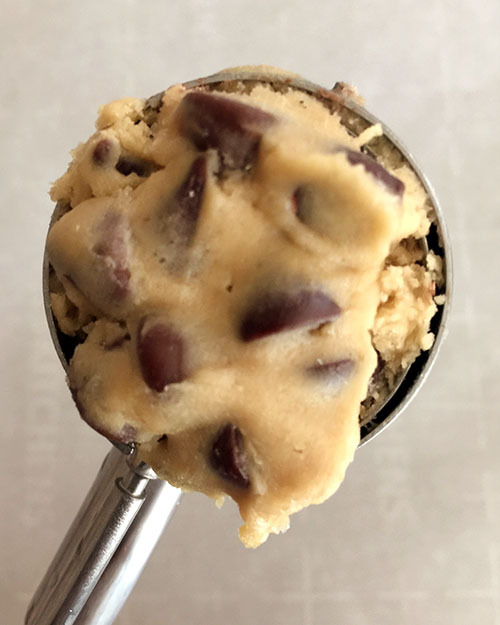 Outside of chocolate chips, the cookie dough itself has components that result in a specific toffee-like, salty flavor. One of the key ingredients is brown sugar. 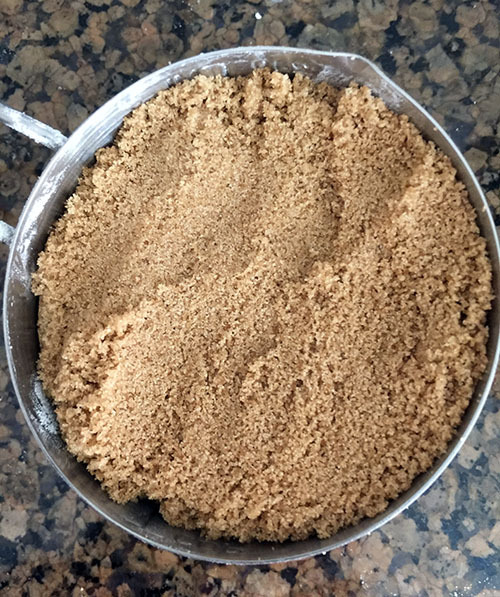 I noticed this recipe had twice the amount of brown sugar to white. This would make that toffee-esque taste extra pronounced. 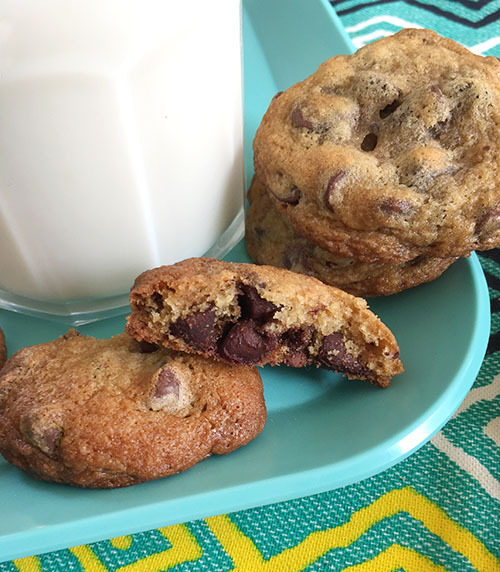 Just as important as the brown sugar is the saltiness of a chocolate chip cookie, not only produced with salt, but also with baking soda (both of which are whisked into the flour), to give the chocolate chip cookie that salty balance for ideal flavor. 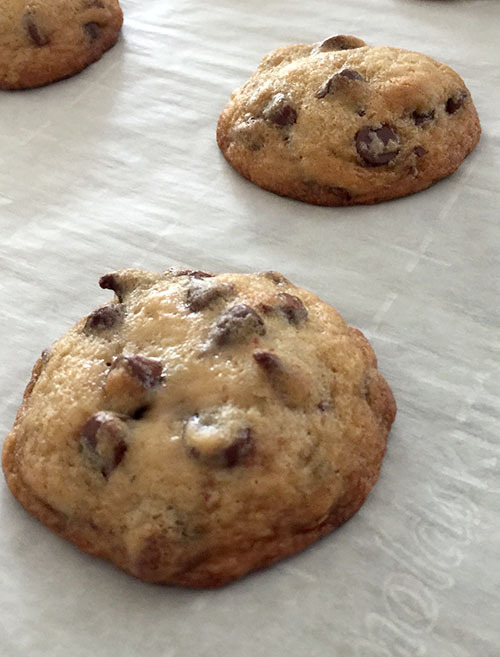 The third flavor element that makes a great chocolate chip cookie is vanilla. 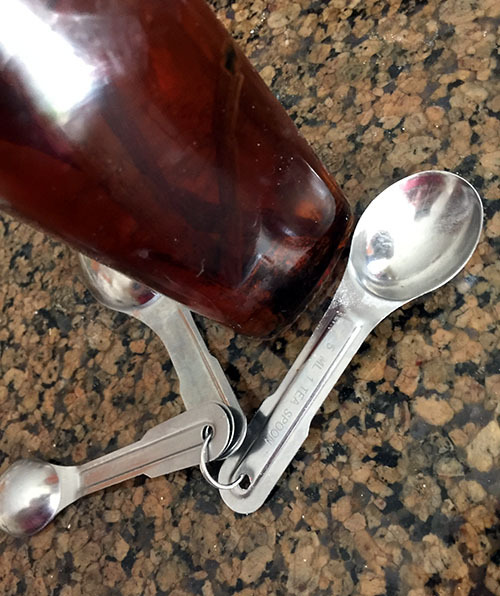 In this recipe there is double the pleasure with two teaspoons of vanilla (many recipes call for a mere one). I think the vanilla helps bolster the buttery, sweet-salty tastes as a bottom note in the cookie. This recipe follows a process similar to many chocolate chip cookie recipes, where butter (softened but still cool. I left mine out for a few hours on a chilly day) and sugars are first creamed to fluffiness, then eggs and vanilla are added. The whisked dry ingredients are added in gradually and mixed briefly. It’s interesting that these days, short mixing times are encouraged. I’ve been around long enough to have grown up in the era when you really mixed and mixed cookies, cakes, etc. I understand now how the texture is kept tender in most baked goods by mixing minimally. 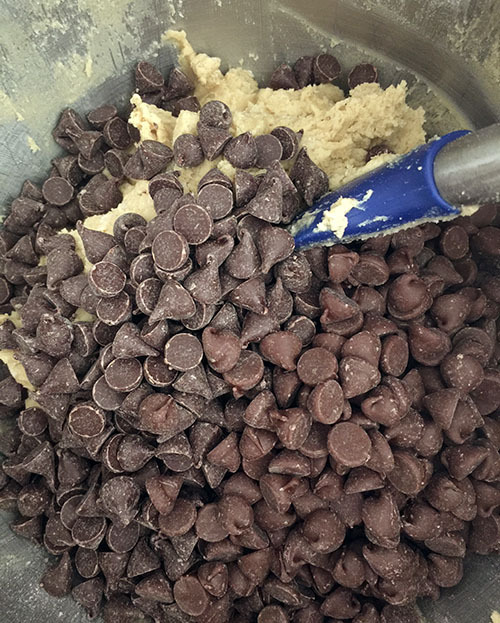 I love how there is an extra helping of chocolate chips in this recipe (about a bag-and-a-half). I used a mix of semisweet and and a smaller portion of milk chocolate, since I had an extra bag of those. 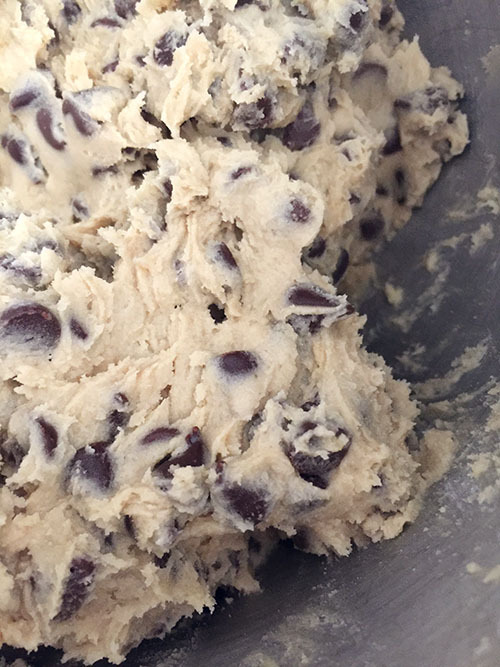 I think probably the newest rendition of chocolate chip cookie recipes call for chilling the dough (this one six hours. I chilled mine overnight). 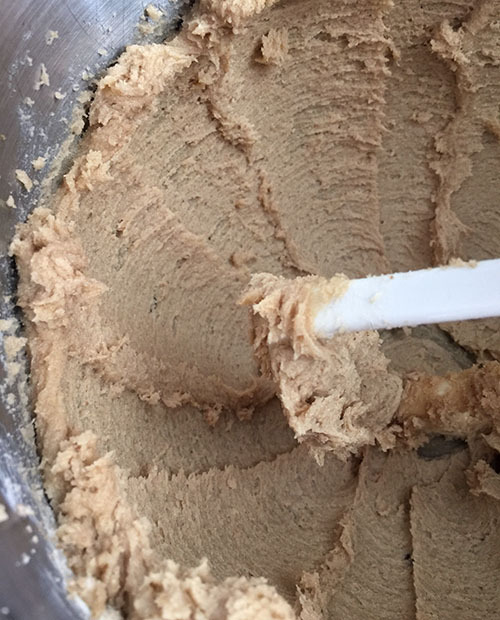 I read recently that this chilling process not only firms up the butter so that the cookies do not spread too much while baking, but also allows the dry ingredients to fully absorb the wet, providing a nice chewy end result. I lucked out and got a rainy afternoon in which to bake cookies (isn’t that the best? 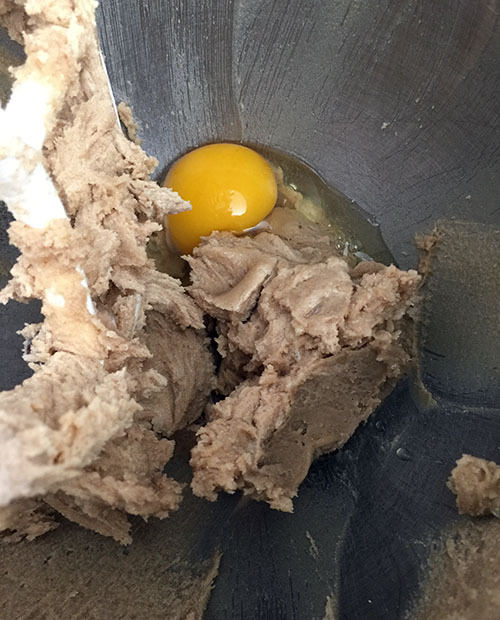 ), scooping the stiffly chilled dough (so stiff, it was a bit of a challenge, but I was pretty flattened from a weight-lifting class that morning) into my hand to form balls. I do believe my scoop was smaller than recommended, because I got about 36 cookies total. My first batch of cookies that baked for 12 minutes seemed a tad dark, so I lowered the time to about 10 for the next two batches. Even the darker ones (I ate one while still warm, of course), provided a perfectly soft-chewy texture and melting chocolate encased in the salty-sweet gold of rich brown-sugar cookie. I sampled one (or two) from each freshly made tray, transformed in silence to the seven-year-old marveling that something so simple could be so good. 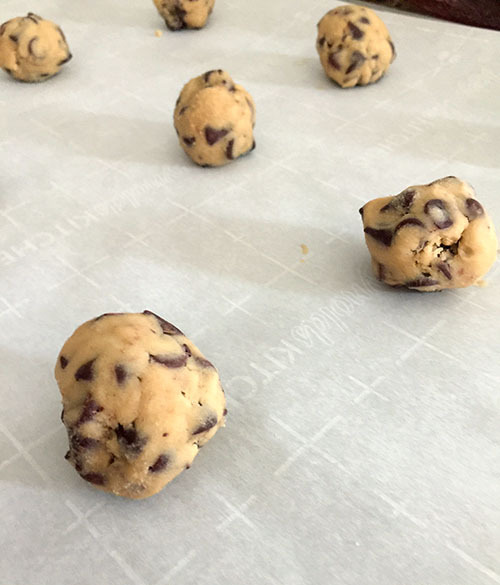 Blogger’s Note: For the recipe, please go to the Baked Sunday Mornings website: http://bakedsundaymornings.com/2019/04/01/in-the-oven-chocolate-chip-cookies/.